Chelsea secured a Carling Cup final meeting with Tottenham thanks to a Joe Cole strike that saw off the challenge of Everton at Goodison Park. Cole scored the only goal of the game when he controlled Florent Malouda's raking ball and sent his half-volley past goalkeeper Tim Howard. Chelsea also went close through striker Nicolas Anelka who hit the crossbar. Everton's best chances came from the boots of Phil Neville and Phil Jagielka whose shots were saved by Petr Cech. With Everton having not beaten their opposition since November 2000 in any competition, the omens were not good for David Moyes' side. But ask Moyes what omens mean to him and you would probably get short shrift. 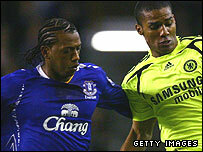 The Toffees played well at Stamford Bridge and were unlucky to be 2-1 down on aggegate going into the second leg. And in the opening moments of the first half they resumed where they left off two weeks ago, dominating possession and flinging in balls, primarily from the boot of Neville, into the area. If it was not Neville keeping the cup holders on their toes it was Spanish playmaker Mikel Arteta, who managed to thread balls into the 18-yard box despite being surrounded by two or three defenders. But Avram's Grant's Chelsea is similar to Jose Mourinho's Chelsea - tight at the back - and the recipients inside the area, Tim Cahill and Andy Johnson, were kept quiet for most of the match. The second stingiest defence in the league coped brilliantly with what came into the danger zone and the only time Ricardo Carvalho and his backline were found wanting was when Joloen Lescott was allowed a free header from 12 yards, which Cech saved low. Cech, whose wife gave birth to their first child earlier in the day, had little else to do in the first 45 minutes, but neither did opposite number Howard. The American was called into action only once during the same period when he crouched down to save an Anelka shot from 14 yards. The French striker, who ambled with intent, went a lot closer straight after the restart when his curling shot rebounded off the crossbar from 18 yards after a good hold-and-pass from Cole. The scare served as a reminder to Everton that they could not afford to lose concentration and they also needed to improve their ideas at the other end. Neville took it upon himself to haul Everton back into the match, but his charge and vicious shot was well saved by Cech. The Czech keeper had only just dusted himself off before going down again to deflect away a Jagielka flick. Had they scored, the game would have taken on a different tone, but instead Chelsea went up the other end and all but secured their place at Wembley thanks to a sublime finish from Cole. The England midfielder's one touch and half-volley from Malouda's searching ball gave Howard no chance. Everton: Howard, Neville, Jagielka, Lescott, Nuno Valente, Osman, Cahill, Carsley (Anichebe 70), Arteta, Fernandes (Vaughan 78), Johnson. Subs Not Used: Wessels, Hibbert, Stubbs. Booked: Carsley, Fernandes, Nuno Valente, Neville. Chelsea: Cech, Belletti, Carvalho, Alex, Bridge, Makelele, Malouda (Ashley Cole 90), Sidwell, Joe Cole (Pizarro 82), Wright-Phillips, Anelka (Ben-Haim 90). Subs Not Used: Cudicini, Ferreira. BBC Sport Player Rater man of the match: Chelsea's Petr Cech 7.84 (on 90 minutes).